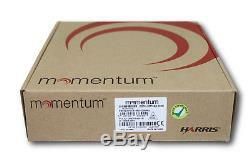 Harris MOMENTUM HDP150 UHF 450-520 Mhz 1024 Ch 4W Digital Portable Radio (NEW). 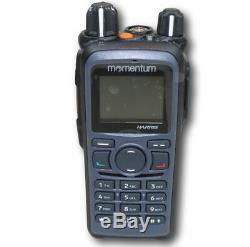 NEW Harris MOMENTUM HDP150 UHF 450-520 Mhz 1024 Ch 4W Digital Portable Radio. Each new radio includes a new charger, new antenna, new belt clip and new Lithium battery. Sorry, but we are unable to program these radios for you. The HDP150 portable is a feature-rich, multimode, portable radio that combines impressive performance with durable construction to support a wide range of user requirements and applications. The HDP150 and the Momentum family of products use Digital Mobile Radio (DMR) standards-based technology to provide reliable, cost effective, open architecture communications solutions. DMR is one of the fastest growing LMR technologies in the world. The HDP150 portable radio meets FCC and IC (Industry Canada) requirements for 12.5 kHz or 6.25 kHz equivalent spectrum efficiency. In analog mode the HDP150 operates on 12.5/20/25 kHz channels. 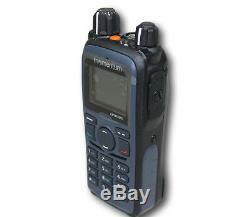 While in digital, DMR, mode the HDP150 provides 2-slot TDMA on a 12.5 kHz channel. 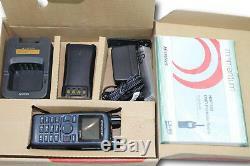 This allows two simultaneous voice and/or data transmissions on a 12.5 kHz channel. Communications security is ensured by the air interface encryption algorithms defined in the DMR standard and implemented in the radio. Advanced Encryption Standard (AES) options and the Scrambler/Encrypt features are available for increased communications security. The HDP150 features a large full-color LCD, large on/off/volume and channel selector knobs, a full system keypad and user-defined softkeys to allow easy operation and a cellphone-like user experience. Integrated GPS, Voice Annunciation, Group and Individual Calls, Vibrate Alert, Remote Enable/Disable, Remote Monitor, and various analog signaling types, including MDC 1200, make this radio a leader in performance and flexibility. 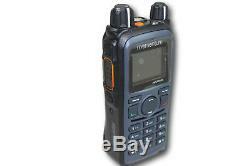 The item "Harris MOMENTUM HDP150 UHF 450-520 Mhz 1024 Ch 4W Digital Portable Radio (NEW)" is in sale since Tuesday, May 1, 2018. This item is in the category "Business & Industrial\Facility Maintenance & Safety\Surveillance & Alarm Equipment\Two-Way Radios". The seller is "erac1" and is located in Lakewood, CO. This item can be shipped to United States, Canada.